Chrysanthemum has adenine, choline, vitamins A, B, amino acids, glycosides, volatile oil, etc. It is a nerve energizer, detoxifier and blood vessel softener in Chinese medicine to maintain healthy cholesterol level, normal blood pressure, improve blood flow. 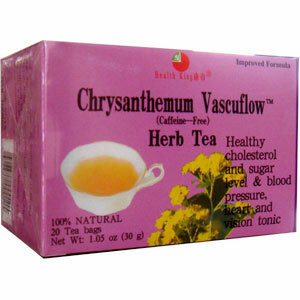 Chrysanthemum Vascuflow Herb Tea (Caffeine-Free), flavored with jasmine flower, is a high-class drink made of quality chrysanthemum and orchid flower. Chrysanthemum has adenine, choline, vitamins A, B, amino acids, glycosides, volatile oil, etc. It is a nerve energizer, detoxifier and blood vessel softener in Chinese medicine to maintain healthy cholesterol level, normal blood pressure, improve blood flow. Used to “sharpen the vision and hearing, calm the nerves and clear the brain”, it remains one of the most important supplementary food items and longevity elixir in China. It is an ideal beverage for cold and flu season, and for general health.